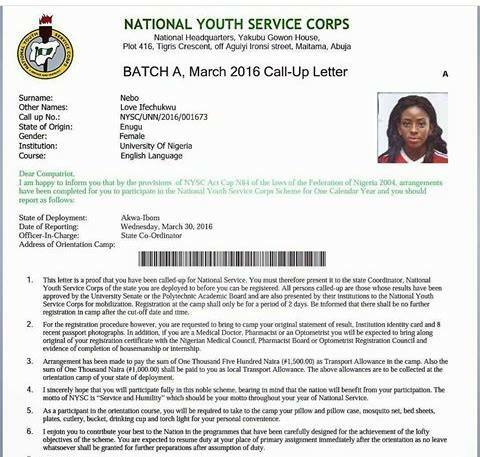 You can now print your NYSC call up letter for batch B corp members that has been enabled on the National Youth Service corps portal today Nov 21. The procedure to follow in order to print the letter, is for candidates to log in to their dashborad with their email and password.There are 2 streams,one PCM is slated for Stream 1,while the other is stream 2.Those who cannot find their call up links on the dashboard will have to wait for the second stream due for January 2017.
commences on Thursday 24th November & closes by 12 midnight on the 25th November 2016.Please it is vital to keep these dates in mind to avoid disappointment. So as a remember once again,here are the vital pints to remember.Visit the portal http://portal.nysc.gov.ng and log in with your email and password.On the dashboard that appears,you will see the message that says Print Call up letter.You then click on it to proceed and download.Anyone who does not find the download link should not panic as they are due for the next stream which is next year January. Good luck and remember the link above is the only legit link to print your call up letter,don't get fooled by other illegal and fake avenues made available.